Our consultation consists of a site visit and a four page proposal work sheet to suit all of your related needs. At this time, we will help you determine what will be best for your individual situation. This in depth report will also help decide on a time schedule. Once our crew arrives on the site, you are assured of a quality, professional job. Each job is treated with the same dedication. Every customer is treated with individual respect. Our experienced crews have been striping parking lots since 2011. We take pride in our work as it is a direct reflection on us if a parking lot is not done correctly. We will ensure that your parking lot, new or old, meets your parking needs. We are professionals and will see that all lot requirements are being met. Should modifications (such as additional Handicap Parking or traffic control issues) not noted prior to arrival at the job site be needed, we will notify you for authorization to take corrective action. From the small jobs and lots, too the large areas and big jobs, we have the equipment to handle your cleanup needs. We do deliver a reliable cleaning service to parking lots or paved surface. Whether that is a sidewalk or a loading dock, our goal is to remove the debris. Increase the life span of your asphalt and fix unsightly and dangerous potholes. We do stenciling for a number of different signs, including handicap signs and directional arrows as well as instructional wording. Let us know your particular needs. Manufactured from 100% recycled rubber, which have a five year warranty, well not warp, crack chip or rot. Made from 100% recycled plastic. We carry and will install either of these attractive types of stopping blocks on your lot for you. Never paint your steel posts again! 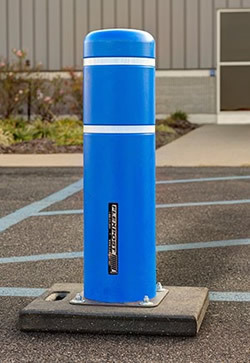 Simply, easy, and permanent insulation from 1/4” to 1/8” bumper post sleeves with decorative and lighted bollards available. 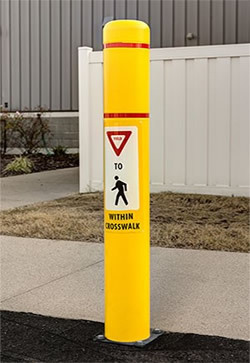 These Polyethylene thermoplastic sleeves come in standard OSHA yellow and red or in custom colors with UV, anti-static additives, and chemical/water resistant options available. These covers help reduce theft and are virtually maintenance free. These are made from 100% recycled rubber for superior construction and durability. They will not warp, crack, chip, or rot. Other positive features are that they are lightweight, easy to install, and have channeled bottoms for cables and drainage. Dimensions: 12" wide x 2½" high in 4-ft. or 6-ft. lengths FlexPost. 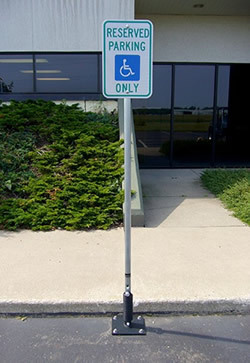 Prevent your parking lot signage from being bent or destroyed with FlexPost.